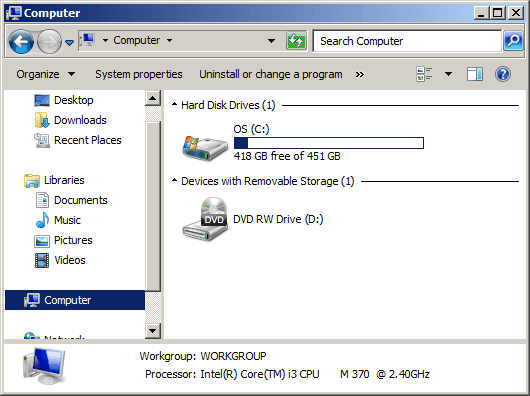 This guide provides an overview on how to find and remove files from your PC. This is important because viruses will create files on the computer which will need to be removed if you plan to manually remove it. However, this guide is also useful in that it will show how to search for files in Windows. Searching for files in Windows XP slightly differs from searching for files in Windows Vista and Windows 7. Warning: Please exercise caution when deleting files from your PC since you can corrupt your computer operating system if you remove files which are needed by Windows. Step 4: Search For File. Use search for all files and folder to search your entire computer. Step 5: Click on file and press delete from your keyboard. This will allow you to delete files. For Windows Vista and Windows 7 – Step 1: Click on the Windows Logo on the bottom left hand portion of the screen. The will bring up the program for Windows Vista and Windows 7. Step 2: Click on Computer. It will be on the right hand menu. Step 4: In order to remove a file, left click on the file and press delete from your keyboard. This will allow you to delete the specific file. You can also right click on a file and select delete. The file will go into the recycle bin. If you have any questions or comments, please feel free to comment below. This entry was posted on Saturday, October 25th, 2018 at 11:48 pm	and is filed under How-To Guides. You can follow any responses to this entry through the RSS 2.0 feed. You can leave a response, or trackback from your own site. Computer infected with PC Protection Center 2018. Has blocked Norton Antivirus – ParetoLogic Spyware use. Will not allow me to download any programs I suspect might clean it off. Any answers? I have gone into the “Tools” section and “Internet Options” area and tried to allow and lower all my setting and save this site of CNET to allow download by it is not letting me. I have two trusted sites in my Trusted Sites area that should not be in there. *.framecrazywinnings.com and *.static.topconverting.com and help in eliminating those too? i did all the steps and after I hit delete is say it can’t be deleted? Any reason why? aiuto..non c’e la faccio più…si e inserito questo programma automaticamente nel pc e nn riesco a eliminarlo..salta fuori ogni 5 secondi e mi chiede di comprare l’antivirus quando io possiedo già un antivirus..come devo fare?? ?a chi mi devo rivolgere? ?posso in un qualche modo mandare una e.mail a questa azienda o quello che sia facendogli causa se nel caso nn disattivino questo programma loro???? whenever i try to look for C:\Program Files\Windows Police Pro\ it just shows whats in that file. do i just delete everything in it one by one? I have located the Cyber Security files on my local drive but am being denied access to delete. Do you know why? My computer pops up a screen/virus also knon as the control center virus..ive tried downloading every spyware or antivirus software this is..but come to find out everyone is just a free scan…I need this virus gone asap…Its slowing my computer down a lot! i need some help please on getting this virus out of my computer without having to buy an antivirus program….Please someone contact me asap via email or cell My name is mike 9418797654 please i need help asap! Thank god for my iPhone, with 3G. - and thank god for this website and all the comments. I managed to get the tssd file closed down, and install stopzilla. I had to pay 10$ for it, but it seems to be quite good. our family laptop pc has been completely blocked by an antivirus program NOD32 (fake I presume) I have tried to uninstall but it will not let me through program/uninstall – we keep getting MS removal tool fake scans of our computer and it tells us we are loaded with viruses- it will not let us execute any program or access the internet- we are desperate our son’s school project is on the computer and it’s due…what can we do?